Okay, so what is this place? It is my personal corner of the web where I get to geek out on Rockman. Exactly how I'm going to go about this,...is about anybody's guess. Be it thought experiments, artwork, research pieces, insights or other, I'll be gathering all that stuff and be presenting it here. To clarify, anything even remotely Rockman related to me is fair game here: So beyond anything baring the Rockman name, I may even wonder off into Cognitive Science and feed forward control systems if I think there's a remote fit. What this place won't be is an echo point for Rockman Game News, the generic strategy guide, or graphic rips of Capcom licensed art. There are already plenty of sites that do that, and do that well. There's no point in me repeating what other people already do, right? As for the short history of this site, It was originally launched on May 8th, 2011 on Yola.com. Unfortunately, usage issues with the service forced me to leave their server in June of that year. Fortunately I was able to find a new home here at Weebly.com. Thus, any article you see from before June 15, 2011 are in fact archieved from the previous host, with things like comments and backward linking lost in the move. Is a total "Rockman freak" to the core, but is the type that spends way too much time thinking over the details and not the type that obsesses over any and everything that happens to have a Rockman label stuck on it. 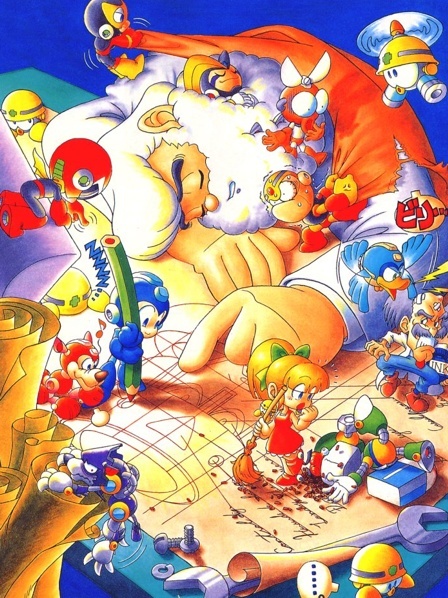 Has intentionally amassed and read a lot of Rockman related information over the years. As a result, has unintentionally memorized too many Rockman related facts to be considered mentally healthy. Is a self-proclaimed Ninja of Justice (....wait, what?) A novice pixel artist, though not focused on as much in recent years. Currently perusing the hobby of custom model building. Other interests includes Cognitive Science, other "modern era" video game franchises, New technology of all sorts and a wide array of Japan's "Modern Visual Culture".